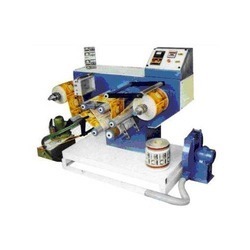 We are one of the most trusted firm engaged in offering a wide range of Rewinding Machine. Our offered range of this products are widely used for unwinding and rewinding the roll toper form a number of application such as inspection, inkjet printing, labeling and all. Further, we hold specialization in offering our entire range in different sizes as per the working area and client requirements. Web Width / Weight 75 – 600 mm. / 50 Kg Max. Rewind Core Dia. 32 & 38 mm. Std. Max. designed speed 120 M / min. Motor 1 HP DC Motor with reduction gear box step less control drive. Looking for Rewinding Machine ?